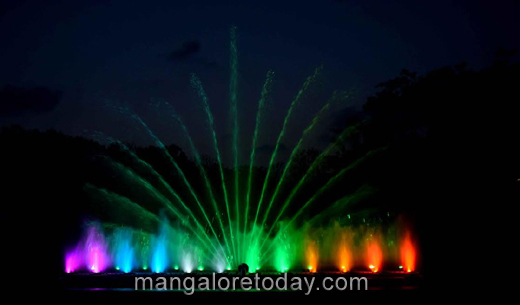 Mangaluru, April 18,2017: Preliminary trials and checks of the musical fountain at old Deer Park, opposite Kadri Park, was successfully conducted on April 17, Monday. It is a prelude to the launch of the new attraction in the city. As planned, the show began with the narration of history of erstwhile Canara district which was later divided into North and South Canara, followed by Yakshagana the cultural connection of the district. 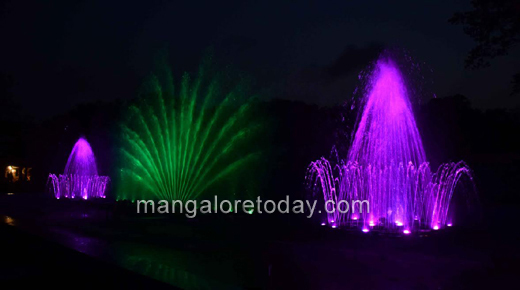 The portraits of erstwhile Keladi rulers, Shivappa Nayaka and Channappa Nayaka who ruled the region in the first century, were also screened during laser show with water as screen in the backdrop. It turned out to be a surprise and new attraction for the visitors to the park after dusk, who came in droves to witness the attraction in the making. Following the trial that lasted 30 minutes, the elected representatives and officials suggested BNA Technology, Bengaluru, which has worked on the fountain to do some finetuning. 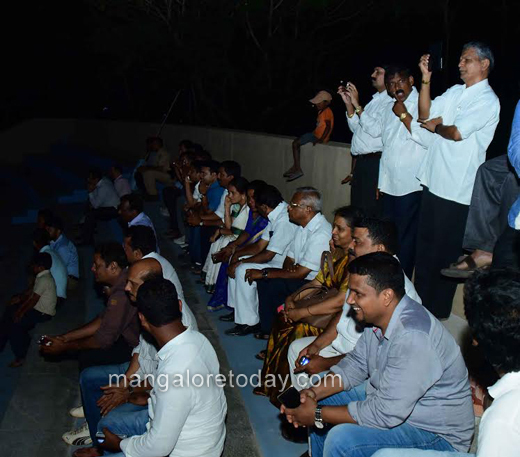 Mayor Kavitha Sanil, Mangaluru South MLA J R Lobo, former mayor Mahabala K Marla, Mangaluru Urban Development Authority Commissioner K Srikanth Rao, deputy director of horticulture H R Yogesha, programme engineer of BNA Technology Satish and others were present. Prior to the trial, DK DC Dr K G Jagadeesha presided over the progress review meeting on the fountain. The officials held a discussion on expediting the works and maintenance of the fountain once it is commissioned. The project shows a high potential. So Kadri park goes along with entertainment.